Ma gisto is the best video editor for people on the move and for those who don’t have formal video editing skills. No video clips on your phone? No problem. 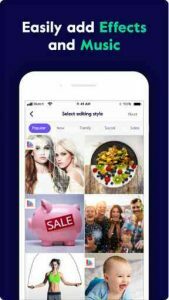 Ma gisto smart video maker can help you create a slideshow or video collage that feels like a true video using only photos. Ma gisto’s intelligent video editor is powered by A.I. which makes video editing semi-automatic. Ma gisto combines video clips, photos, music, text, video effects and video filters to help you tell your video story. Ma gisto video maker has a library of commercially licensed songs from rock to cinematic. Or use your personal music collection. Ma gisto video maker uses sophisticated A.I. to find the best parts of your footage.. Ma gisto intelligently applies video editing techniques including stabilization, facial recognition, video filters, video effects, and auto video crop to create eye catching videos that outshine the average slideshow or video collage. Easily share your head turning videos in one tap directly from Ma gisto to Facebook, Instagram, YouTube, Google+, Twitter, Whatsapp, Vimeo, email, messaging, websites, & blogs. Ma gisto is a free video editing service, our Premium & Professional subscriptions offer additional powerful capabilities for even better video storytelling. Ma gisto Premium and Professional add the great features above and are available through an auto-renewing subscription. Subscriptions will be charged to your credit card through your iTunes account. Your subscription will automatically renew unless cancelled at least 24-hours before the end of the current period. Account will be charged for renewal within 24-hours prior to the end of the current period. You will not be able to cancel a subscription during the active period. Manage your subscriptions in your account.